IntelliScanner added a pair of products to its line of scanner-based organization tools—one that shrinks down the scanner and the other that targets business users. The IntelliScanner mini is a tiny scanner that reads the barcodes of the media you own and uploads them to the Mac so you can organize your belongings. IntelliScanner mini features an ultra-portable barcode scanner—one about the size of a Zippo lighter—and software for organizing, searching and sharing collections. Scanning a barcode with the mini and upload its information to the Mac via USB; the IntelliScanner software will automatically track home assets and valuables, with special features to instantly identify books, wine, comics, DVDs, groceries and more. IntelliScanner SOHO performs a similar function for small business users, allowing them to automatically create and manage a stock inventory. The software provides detailed reports, notifies when stock is running low and totals the value of current inventory. Advanced tools allow users to change quantities on the go and reconcile inventory. In addition, IntelliScanner SOHO, cubed integrates with LightSpeed, XSilva’s point-of-sale system, for use in retail environments. Both products organize assets that do not have barcodes by applying IntelliScanner Custom Asset Tags, pre-printed, customizable barcode tags and require Mac OS X or Windows XP/Vista and an available USB port. 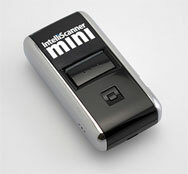 The IntelliScanner mini and SOHO offerings also have a “cubed” moniker, for the metal box that contains each product. IntelliScanner mini cubed starts at $179 and features software for cataloging media such as books, CDs, DVDs and games; the complete home organization software bundle costs $249. IntelliScanner SOHO cubed costs $299. The software that accompanies both products requires OS X 10.4 or later.